Treat your tastebuds with the flavor of nature, and enjoy the smoothness of our Soursop ice cream. Box containing 6 pints of ice cream of 16 oz each. Soursop, citric acid, milkfat, nonfat milk,sugar, corn syrup,buttermilk, whey, mono & diglycerides, guar gum, cellulose gum, disodium phosphate, calcium sulfate, polysorbate 80, locust bean gum, carrageenan, gelatin, artificial flavor, vitamin A, palmitate. From the moment you slice the fruit open, its intense aroma captures all of your senses. It’s almost like you’re in a tropical rainforest surrounded by nature and its beautiful landscapes. 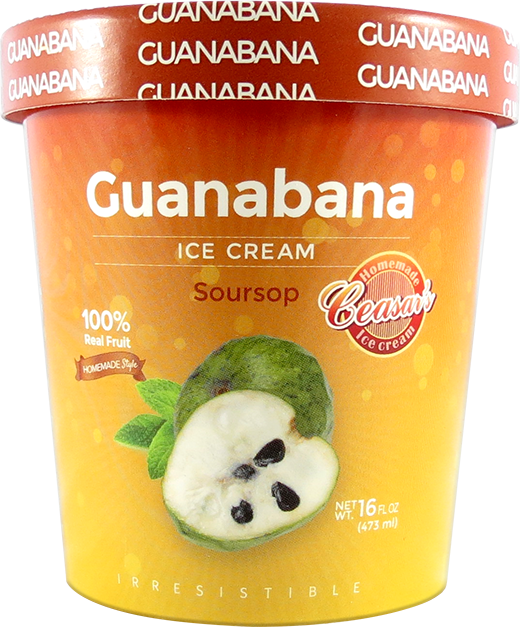 Our mouth-watering Soursop ice cream is sweet, juicy and made with real fruit pulp. It is nearly impossible to sneak a scoop – or two! With hints of sweetness and its silky consistency, you are sure to embark on a tropical adventure.